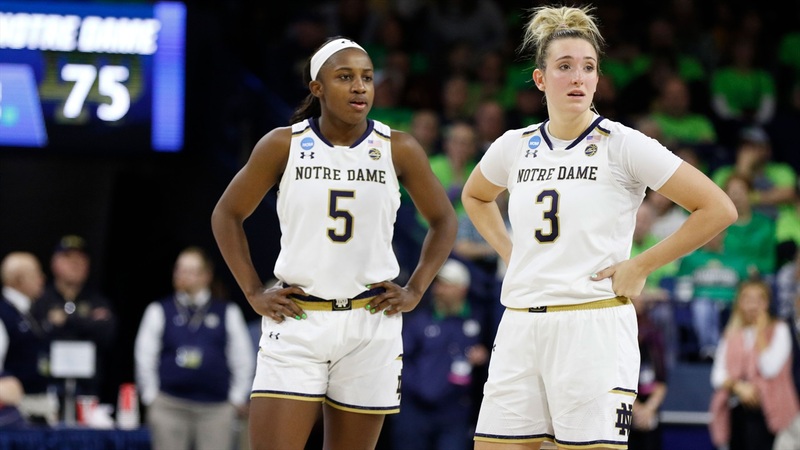 After rolling over Bethune-Cookman by 42 points Saturday, Notre Dame will face a more formidable foe Monday night in a battle to advance to the Sweet Sixteen. Michigan State scored with 7.6 seconds in its first round match to edge Central Michigan 88 to 87 and the opportunity for a second round game against the Irish. While the Spartans went 9 and 9 in the Big Ten, they did earn some significant wins in the course of their 20-11 regular season. They were talented enough to beat Oregon 88-82 at home in December, and MSU also holds wins over Iowa and Maryland during conference play — a fact not lost on Notre Dame head coach Muffet McGraw. Michigan State averaged 75.5 points per game this season, but Spartan head coach Suzy Merchant knows that her team has to score to counteract the high-powered Irish attack. Notre Dame leads the NCAA in scoring and Saturday’s 92 point output increased the season scoring average to 89.1 points per game. All five Irish starters average over ten points a game, and Michigan State features similarly balanced scoring with three players averaging between 12.2 and 14.5 points per game, and two others over nine points per game. Shay Colley (#0), a 5’8” red-shirt junior, leads the Spartans with 14.5 points per game. She only scored 13 against the Chippewas, but hit the game-winner on a drive to the basket with her team trailing by a point. For the season, she made 38.7% of her field goal attempts and 32% from three. She also contributes 5.3 rebounds per game. Jenna Allen (#33), a 6’4” senior post, averages 12.6 points and leads the Spartans with 6.6 rebounds per game. She shoots 50.2% from the field and 80.6% from the line. Guard Nia Clouden (#24), a 5’8” freshman guard, is the third double-digit season scorer at 12.2 points per game. She is MSU’s assist leader with 129 against 68 turnovers for an assist to turnover ratio of 1.9. She had 16 points and seven assists against Central Michigan. While everyone in the lineup is a willing and able three-point shooter, the Spartan’s main threat is 5’5” junior guard Taryn McCutcheon (#4). She converts 39.1% of her long-distance attempts, and her 79 made threes is nearly 40% of the team’s total. She averages 9.9 points per game in just under 34 minutes of playing time per game. Her 127 assists is second on the team. Her assist to turnover ratio is 1.9. She played all 40 minutes against Central Michigan and scored 12 points. The leading scorer on Saturday came off the bench to tally 21 points. Sophomore Sidney Cooks (#10), a 6’4” forward, averages 9.2 points per game on the season. She has 31 blocks to lead the team in the category. Michigan State’s fifth starter is a 6’1” red-shirt Junior, Victoria Gaines (#15). She’s averaged 6.6 points and 5.5 rebounds per game. She shoots 49.5% from the field, but just 51.4% from the line. The Spartans have two other bench players that average over 15 minutes a game — Mardrekia Cook (#2) and Nia Hollie (#12). Cook, a 6’0” red-shirt freshman forward, averages 6.3 points and 3.9 rebounds. Hollie, a 6’0” junior, averaged 3.5 points per game. She only played five minutes against Central Michigan. On offense, the Spartans make 44.1% of their field goal attempts and 36.8% from three. They average 7.0 made threes per game. As a team, they convert 71.8% from the line. They average 18.0 assists and 14.1 turnovers per game for a positive 1.3 assist to turnover ratio. The Spartans average 3.5 blocks a game. Michigan State opponents have scored 67.9 points per game on 41.9% shooting. The 87 points scored by Central Michigan Saturday was the highest point total against MSU all season. MSU doesn’t apply full-court pressure, but their guards will be aggressive on the ball in their defensive end. The Irish are expecting a mix of man-to-man and zone defense from Michigan State. If the Irish get by Michigan State Monday evening, they’ll face Texas A&M in the first regional game in Chicago next weekend. The Aggies beat Marquette 78 to 76 on Sunday. The Irish faced A&M in the West regional semi-final last year and came from behind to beat the Aggies 90 to 84. Notre Dame hosted Michigan State in the ACC-Big Ten Challenge last season and beat the Spartans 90-59. The two teams also played a closed-door, controlled scrimmage against each other before the start of this season. Mikayla Vaughn logged 23 minutes against Bethune-Cookman — her most playing time in a game since December. She had 9 points and 11 rebounds as she continues to recover from the season-ending ACL injury she suffered in late November 2017. Mabrey hyper-extended a knee in practice early last week, and Prohaska sprained an ankle on Thursday. Mabrey played 23 minutes on Saturday, but failed to score for the first time all season. She did have seven assists. Prohaska logged 20 minutes of playing time against Bethune-Cookman despite the ankle sprain. One final note — Coach McGraw was asked Sunday how the Irish discovered Canadian Natalie Achonwa. Monday night’s game against Michigan State is scheduled for a 7 pm eastern tip-off. The game will be televised on ESPN. In-game updates will be posted below.